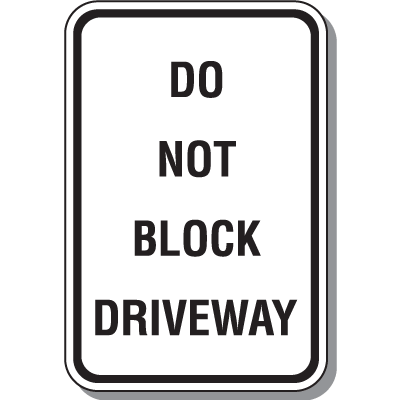 Keep your parking lots safe from vehicular collisions by using Seton’s Do Not Block Driveway signs. Part of our wide selection of Parking signs, these signs are efficient in keeping people within your facility aware of your parking rules and procedures. These can easily helpt to prevent traffic congestion and accidents. Our parking lot signs contain standard wordings and universally recognizable graphics which can effectively direct traffic flow in your parking area. Made from durable materials, these driveway signs are ideal for outdoor use and are guaranteed to withstand harsh conditions for up to 7 years. Safely directing the flow of vehicles in and around your parking lots is now made easier with the use of Seton’s Do Not Block Driveway signs. We carry engineer-grade reflective aluminum and high-intensity reflective aluminum parking signs that are both compliant with MUTCD standards. These reflective signs are highly recommended for nighttime use and for use in poorly lit areas. For those areas that do not require the use of reflective signs, we also have signs made from durable non-reflective steel. To further increase the service life of your signs, you have the option to upgrade to Seton UltraTuff™ overlaminate. This extra layer provides stronger protection against abrasion, dust, fading, and chipping. Proper sign placement and installation is as important as choosing the right sign for your facility. To maximize the benefit of your driveway signs, make sure that these are properly mounted in places that are easy to spot and well-illuminated. You also need to ensure that these parking signs are securely installed to prevent theft and injuries caused by signs falling off accidentally. Seton offers a wide variety of sign posts and accessories that will go well with your parking signs.